Actually, we are probably the first anywhere in the world to explain, nice and simple, that Edward de Vere is Shake-speare by identifying The Three Dead Giveaways: The Hyphen, The Mask, and The Daughter. The elite, the prominent leaders in Australian society – tenured academics, the Theatre Fraternity (John Geilgud admitted it) and politicians – that allow this sham to continue should be individually ‘named and shamed‘ with a Fair Dinkum Australian Rating of 1 Star. They were called on it, but said, and did nothing. This one denial will drag down everything else they have done. They will go down in posterity as un-Australian, for ultimately failing our children on such an important issue – the identity of the Civilization’s most famous writer – more books and movies are produced on Shake-speare than any other figure, including godheads. So far they have been able to conveniently put up a straw facade around themselves, but there is a tsunami coming in October ‘2011. Aptly hot on the heels of the Egypt Renaissance, one of the world’s oldest Civilizations. Even Wikipedia’s elite spoilt Amer Eng Lit Major editors failed to recognize the importance 2 other forgotten key players forming the Triumvirate. They had no Wikipedia page at all, so we had a go, even though we knew they would come down on us. 1) A place for discerning Australians to get together – especially primary, secondary, tertiary students and their parents who are not happy with what is taught in our schools. We aim to expose the Establishment’s so-called ‘scholars‘ and their multi-million dollar Stratford Shakespeare Industry who hold out to our children Guillem Shaksper as the author of the William Shake-speare canon, and highlight the mounting historical evidence that points instead to Edward de Vere, Earl of Oxford. 2) “Theatre in Education – TIE added to the Education Curriculum. Lobby our Government, both State and Federal and make TIE an Election issue. Filmmaking is a natural progression from TIE especially because it is so easy to film Plays with an iPhone, and upload them to Youtube. It’s the perfect time to push for Theatre Channels – starting with Youtube, and eventually on Cable TV and Digital Radio. Eventually we could have Theatre Channels for each category. All funded by Sponsors – they would certainly get a bang for their advertising buck. It would be economical to video too, even using iPhones – ‘Single camera drama‘ is already happening. A new Theatre to show TIE productions and hold annual School Competitions and a Big Awards Night. “De Vere Society Presents” would have interviews and pre-production Documentaries on new Plays. All broadcast on our Theatre Channels. Really, STOP and IMAGINE for a moment …Wuh, any time you like you can switch on your TV, Radio, iPhone, iPad, etc. and catch a Play – Shake-speare, other forgotten revolutionary Plays in the canon by the epochal Silexedra production house (Fisher’s Folly, Bishopsgate) – Vere and his early band of frontmen (1579-1589 then he settles down with Elizabeth Trentham and only uses the perfect match patsy for his Shake-a-spear epithet): John Lyly (Euphues – the first English novel, dedication to Vere); Anthony Munday (Robin Hood contribution); Robert Greene (“Menaphon: Camilla’s Alarm to Slumbering Euphues in his Melancholly Cell at Silexedra” – and its Preface by Thomas Nashe/aka Francis Bacon “[Vere] will afford you whole Hamlets, I should say handfuls of tragical speeches”, and Shake-scene = Theatre-scene – Vere’s whine at Edward Alleyn, the real “upstart Crow”; Thomas Kyd; Thomas Lodge “Rosalynde: Euphues Golden Legacy, Found After His Death In His Cell At Silexedra” (based on As You Like It); and Thomas Watson who brought along a young Christopher Marlowe — especially Tamburlaine the Great (‘Timur the Lame’), The Spanish Tragedy (“Hieronymo’s mad againe” – the line chosen by TS Eliot for the end of The Waste Land), modern classics, new playwrights, and of course student productions from Kindergarten to University. 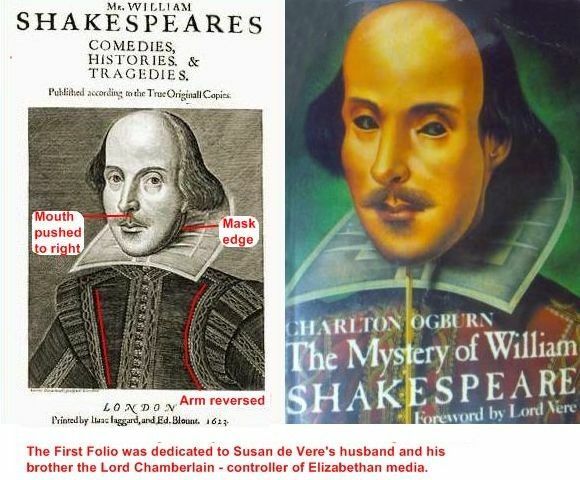 We also created the Wikipedia pages for Susan de Vere and Elizabeth Trentham – though de Vere’s daughter and second wife are the key individuals most responsible for making possible the existence of the Shakespeare canon we enjoy today, there were still no separate Wikipedia pages for them after some 9 years. We were the first to recognize that Edward de Vere (Shake-speare), Elizabeth Trentham (Prime Shaker) and Susan de Vere (First Folio Shaker) form a kind of Triumvirate. b) Continue to perpetuate the sham: Stratfordian – Willie Shakspere. And in an age where content is required for 100 cable channles, i-phone downloads, DVDs – doesn’t this issue also shine the spotlight on where the jobs are going to increasingly be – writing, acting, directing, producing, photography, marketing… So if we already have in our Education Curriculum teachers for the ‘extra activities’ to the ‘3Rs‘, like: Art, Music, Dancing, Library, Sport, Debating, Languages, Religion… isn’t it time we make “Theatre & Film Studies” compulsory. The De Vere Society of Australia – Australia’s most informed authority on Edward de Vere as William Shakespeare (aka Oxfordian Theory and the Shakespeare Authorship Question) – Shake-a-Spear at Ignorance for Edward de Vere in Australia by joining up. You might be interested in visiting the website, http://www.oxfordinstitutepress.com and take a look at my book, Oxford: Son of Queen Elizabeth I, which was the first book on Oxford being the son of the Queen.